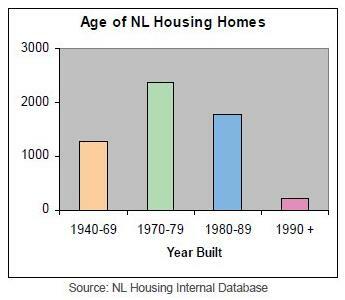 The graph showing when public housing dwellings were built comes from A Social Housing Plan for Newfoundland and Labrador page 6. The data are for the entire province. Note the substantial increase in dwellings during the 1970s, the decline in numbers during the 1980s followed by the absence of new dwellings after 1992. The goal of housing policy in Canada has always been home ownership and it relies on the market to provide the dwellings. The experience of the Depression brought to the attention of the public the need for affordable rental housing for low income families. Public housing was developed as transitional housing, intended to be a helping hand on the road to home ownership. The National Housing Act was changed after the Second World War. Federal money became available to build public housing. Newfoundland and Labrador quickly took advantage of the policy. By 1961, 5% of Canada’s public housing was built in Newfoundland, which had 0.5% of Canada’s urban population. Provincial housing agencies came into existence in the 1960s. The Newfoundland and Labrador Housing Corporation was created in 1967 to develop and provide policies and programmes for public housing. Increases in funding from the federal government during the early 1970s enabled a doubling of the number of public housing dwellings in Newfoundland. Co-op housing was introduced in the 1970s to provide a “social-mix” to counter-act the stigmatization that had resulted from the creation of public housing developments. Six housing co-operatives in St. John’s currently provide 108 dwellings. The non-profit programmes of the late 1970s added in-fill housing as options for low-income families. In the 1980s, the decision that the federal government would restrict housing assistance to “very low-income” families reduced the funding for public housing. The numbers of new dwellings built declined. In 1992, the federal government withdrew from funding public housing, and in 1996 the administration of all social housing was transferred to the provinces. In the blink of an eye, a process built up over fifty years to provide affordable housing was dismantled.